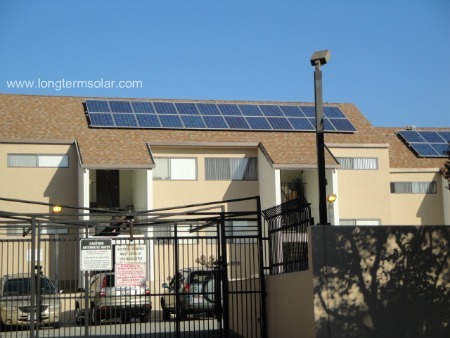 Why is it that solar panels are not a more common sight on the average apartment complex in the United States? Well, one of the biggest reasons is the cost factor, that we all know. 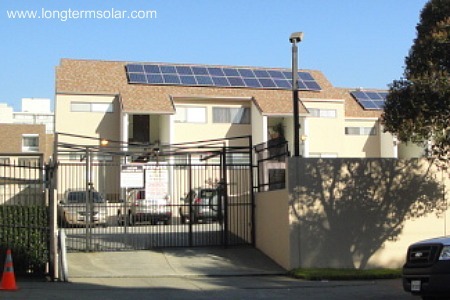 Another reason is that more often then not, the community that often makes up the ownership of the individual apartment units may not always agree or even desire to have solar panels producing electricity. Especially if some of the apartment owners feel the solar panels are going to be an eye sore to their views. But at the end of the day, there are lots of longterm financial equation reasons that a community owned solar PV system makes a ton of sense. If I was interested in moving into a newly built apartment building, and if I was also going to be an owner of a single apartment, solar does make sense. What would be necessary however, is for some ground rules to be in place. Some of these would be based on maximizing the financial benefits the solar electricity could offer the owners/apartment dwellers. So for example, if the local utility is willing to allow for a grid connected solar system, that is obviously a huge first step. Also, if there are certain maximums in terms of size of the solar system, that must be taken into consideration as well. If it was possible for the solar system to be built while the building was being constructed, that would allow for installation costs to be as low as possible, which is also great. And, if there was agreement to put all the electricity that is produced towards covering common costs that the apartment owners would otherwise being paying in HOA fees, well, that to me sounds like a good thing right? In the event that there was an excess amount of clean solar power produced, and the local utility was offering a cash compensation back to the producers, well, that extra money could be put in the general fund of the apartment owners and use to cover other expenses. With a program like this, the overall time and effort in deciding what to do with the solar power created would be minimal. Everyone would be on the same page, and everyone would benefit as well. And of course the 25 plus years of expected solar energy would most definitely increase in value over time. And who knows, there might even be other bonuses out there such as selling REC’s (renewable energy credits) and maybe other deductions or incentives that could make the financial model look even more appealing.